It’s critically important to make wise and healthy choices in daily life, Lt. Gov. 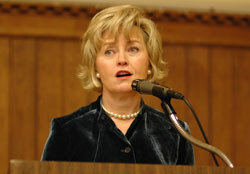 Becky Skillman told 350 Catholic high school students from central and southern Indiana on March 6, and it’s equally important to wait until the time is right to make major life choices. The lieutenant governor arrived at the Catholic Center in an ethanol-powered SUV and made time for several media interviews before the program. Indiana has lots of bright and talented young people who are making a difference in the Hoosier state now, she said in an interview, and who will continue to improve the quality of life here for many years. She noted that teenagers carry their personal histories with them throughout their adult lives. After the teenage peer mentors greeted Skillman with enthusiastic applause, she told them that the good things in life evolve one day at a time as a result of hard work and dedication, and should be savored and enjoyed as important accomplishments. A native of Bedford, Skillman said she has been married to her high school sweetheart, Steve, for 38 years and they have one son, Aaron. She served 12 years in the Indiana Senate before Daniels asked her in 2004 to serve as his running mate and lieutenant governor if he was elected to the state’s highest office. Skillman said every change in her life brought exciting new challenges that were worth waiting for years. Everyone has dreams and goals for the future, Skillman explained, but it’s important to remember to stay “fully invested” in the present. Skillman said her husband is four years older so they waited several years to begin dating. After their marriage, they had to wait 10 years until their only child was born. Skillman said her grandfather was a special role model in her life, and she recognizes the importance of good mentors for young people. Msgr. Joseph F. Schaedel, vicar general, represented Archbishop Daniel M. Buechlein at the awards program. He said one choice—one 30-second decision—can change the course of a person’s life forever. Margaret Hendricks, program coordinator of the A Promise to Keep peer mentor program, said more than 350 Catholic high school students in Marion County alone have been mentors to more than 5,000 middle school students during the 2007-08 school year. Their distinguished volunteer service was also recognized by Indianapolis Mayor Greg Ballard, who sent a proclamation honoring the peer mentors from Bishop Chatard High School, Father Thomas Scecina Memorial High School, Roncalli High School, Cardinal Ritter High School, Cathedral High School and Brebeuf Jesuit Preparatory School in Indianapolis.